On 15 May 2013, Ghanaian President John Dramani Mahama announced the establishment of an Inter-Ministerial Task Force aimed at bringing ‘sanity’ to the country’s rapidly (and chaotically) expanding small-scale mining sector. Over the course of the next month, the army and police proceeded to ‘flush out’ and deport nearly 5,000 foreign nationals who were illegally engaging in small-scale mining—the vast majority of whom were Chinese, primarily originating from Shanglin County in the country’s Guangxi Zhuang Autonomous Region. While there are still some reports of illegal miners setting up new operations ‘deep in the bush’, most of the estimated 50,000 Chinese that flooded into Ghana, mainly between 2008 and 2013, have either been deported or have left of their own accord. This brief but intense episode has much to tell us about the perceptions and outcomes of large-scale global migrations, and the ways in which scarce and valuable resources are allocated in the Global South. At the same time, it provides a way of understanding what the increasingly large presence of China on the African continent means for labour and livelihoods in both places. The sudden influx of these small-scale miners to Ghana also draws parallels with Chinese involvement in other gold rushes throughout history. Most notably, the mass exoduses to the United States and Australia in the nineteenth and twentieth centuries—both of which resulted in violent confrontations, strict immigration policies, and the demonisation of the Chinese as ‘invaders’ by local labour movements. 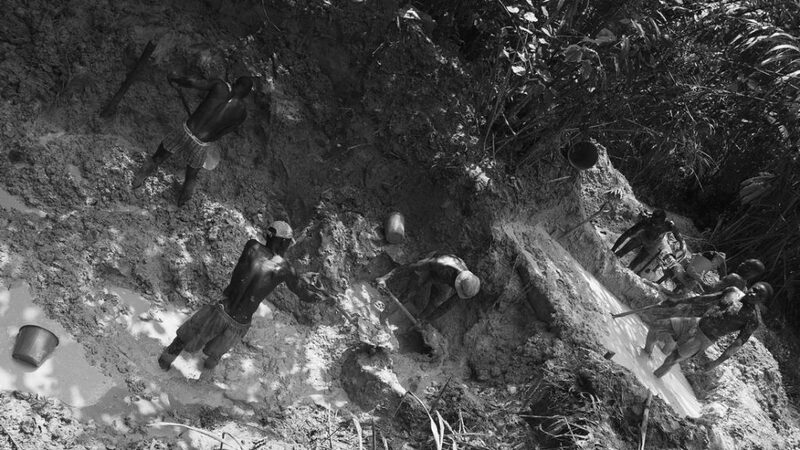 Indeed, in contemporary Ghana, as in previous gold rushes, the Chinese migrant miners have been implicitly depicted as a homogeneous mass that is working in unison, collectively benefiting from the extraction of Ghanaian gold at the expense of poorer segments of the local population, and having a uniform (primarily negative) impact on the environment, economy, and lives of local people. This essay will begin by examining the sudden arrival and equally sudden departure of small-scale Chinese miners in Ghana. It will then go on to raise important questions for future research related to China-Africa migration dynamics, the labour relations and inequality existing amongst the Chinese, and the allocation of the extracted resources back in China. Ghana is the second largest gold producer in Africa, and artisanal gold mining has been a traditional indigenous activity in the country for centuries. Particularly over the past few decades, small-scale mining has become an increasingly important way for poor and marginal segments of Ghanaian society to improve their livelihoods by supplementing low returns from farming. In recognition of the importance of this activity for poor rural people, in 2006, the government specifically restricted the sector to Ghanaian citizens, making it illegal for foreign nationals to engage in any small-scale mining activities. However, this attempt to reserve small-scale mining for Ghanaians was unsuccessful. From 2005, large numbers of Chinese miners began to arrive to Ghana, mostly from Shanglin County. Shanglin, whose population is primarily ethnically Zhuang (a minority group), has a long historical tradition of gold mining. Throughout the 1990s, Shanglin residents migrated domestically within China to engage in small-scale mining around the country. When the Chinese government tightened regulations on this type of activity, the Shanglin miners looked outward. In the late 2000s, stories of people ‘striking it rich’ in Ghana, combined with the increase in gold prices in 2008, resulted in a mass influx of Chinese miners establishing over 2,000 mining operations. Most of the ‘Shanglin gang’ took up mining in the rural areas surrounding Kumasi, Obuasi, and Takoradi, compensating the owners of the land with usage fees, and often paying percentages to local government officials or tribal chiefs. In general, mining activities were financed by individual Chinese investors or small groups of partners, who borrowed and pooled larger sums from financial institutions in China in order to purchase excavators and large pumps for dredging. The miners then employed workers from China who were promised set monthly wages, and local Ghanaians who were paid daily at a substantially lower rate than the Chinese workers. The Chinese involvement in the sector has resulted in a huge jump in the production of gold from small-scale mines in Ghana. And at the height of the gold rush it was estimated that billions of yuan were being sent from Ghana to China—far more than the Ghanaian governmental revenue. The sudden influx of Chinese miners, and the expansion of their small-scale mining operations, was facilitated through cooperation (or collusion) with Ghanaians, many of whom benefitted individually from their relationships with the Chinese. This situation led to the widespread perception—particularly in the media—that the mining phenomenon was feeding into corruption, and that these corrupt activities were the reason the government had largely ignored (or even protected) the illegal miners. In many cases this perception was entirely justified, with Chinese miners bribing officials to ‘turn a blind eye’ or paying-off local chiefs in order to illegally gain access to land for mining. For instance, Ghana Immigration Service officials allegedly enabled entry into the country and then provided (false) work permits to Chinese miners for a fee. Ghanaian small-scale miners also reported that, if challenged, Chinese miners would ‘threaten to call the minister or police commander,’ suggesting close links to high levels of government facilitated by bribes. The Chinese mechanisation of the small-scale mining industry also had huge environmental impacts through the pollution of bodies of water and the clearing of large areas of agricultural land. The introduction of new technologies and mining teams—replacing traditional techniques—meant that the Chinese miners were able to extract much larger quantities of gold than their Ghanaian counterparts. The increasingly visible wealth of the Chinese miners, particularly of the main investors, unsurprisingly resulted in a narrative of resource theft. The Chinese were depicted as stealing a vital livelihood resource from marginal Ghanaians, while also extracting the country’s wealth and sending it back to China through illegal channels. In a 2014 interview conducted in Upper Denkyira East Municipality, a licensed Ghanaian concession holder who had worked with Chinese miners expressed the view that ‘gold was sent direct to China’ with ‘so many ways’ of doing so. He recounted one method where containers that brought machinery into the country were then used to smuggle gold back to China by cutting out part of the container, filling the inside with gold, and then re-welding it. While most interactions between the Chinese and Ghanaians were collaborative in nature, the negative perception of the Chinese miners was also exacerbated by the widespread reporting of some violent conflicts that coincided with their arrival. As the operations successfully began extracting gold, they also became targets for local bandits and armed robbery. This prompted the Chinese miners to arm themselves—often with guns purchased illegally from the local police—and engage in firefights with would-be thieves; resulting in the deaths of both Chinese and Ghanaians. Finally, in mid-2013, the combination of these issues presented too large of a political challenge to the Ghanaian government, and President Mahama established the Task Force, stating: ‘The government will not allow their [the illegal miners] activities to cause conflict, dislocation, environmental degradation and unemployment when in fact the sector should rather benefit our communities and our country.’ With that, the Chinese gold rush in Ghana was largely brought to an inglorious end. So what does this tell us about the perception of Chinese migrant miners in Ghana, and the role of Chinese migration to the African continent more generally? While the story has been reported on extensively—primarily from Ghana—the picture that has been presented fails to shed light on a number of important aspects of this episode of mass migration, resource extraction, and wealth production (for some). In general, depictions of the Chinese miners in Ghana have been essentialised representations. The miners themselves are largely described as a homogenous group composed of individuals with the same ambitions and having the same potential to ‘strike it rich’. This perception of the Chinese as a uniform mass, rather than differentiated individuals and subgroups, follows classic tropes and popular representations of mass migrations in general and Chinese mining migration in particular, both historically and in contemporary discourse. Most notably—and notoriously—both the ‘Chinese Exclusion Act’ in the United States and the ‘White Australia Policy’ were the direct result of antagonism towards the sudden arrival of large numbers of Chinese miners, and their perceived ability to extract more gold than ‘local’ miners through collective effort. Moreover, it is well known that after the end of the gold rushes in the United States and Australia, the remaining Chinese were demonised by local labour movements and accused of undercutting wages. Similarly, the short-lived Chinese gold rush in Ghana has seen ‘the Chinese’ as a whole being blamed for causing widespread environmental degradation, feeding into corruption, increasing violence, stealing the livelihoods of poor Ghanaians, and capturing the country’s resources. While these problematic issues arising from the sudden influx of Chinese miners and the rapid expansion of mining activities should certainly not be underestimated, the current depiction of the Chinese in Ghana as a singular group tends to obscure as much as enlighten. In particular, these representations fail to explore the migratory and class dynamics that gave rise to the exodus in the first place. They also turn a blind eye to the ways in which different types of Chinese miners benefitted or lost out, and ignore the developmental impacts back in China. Little is known about the Chinese miners themselves, other than the fact that they mainly come from a single poor county in the Guangxi Zhuang Autonomous Region. Even less is known about the labour relations that operated within the small mining groups, or the social processes within China that gave rise to the wider migration phenomenon. While the mining groups are often described as collaborative efforts of ‘partners’ investing together; hierarchical structures have also been observed, with individuals or small groups hiring wage labourers from China. This points to the likelihood that the individual Chinese miners in Ghana have benefited in significantly different ways—with some potentially even being exploited. After all, research on small-scale mining within China has shown that the contribution to the livelihoods of miners is highly differentiated, with wealthier investors profiting at a much higher rate than more marginalised individuals. Research has also documented the ways in which poor Chinese migrant workers are often exploited through the withholding (and sometimes non-payment) of wages by ‘labour subcontractors’ (baogongtou) operating in townships and villages. Ultimately, this points to the need for research following up on the Shanglin miners who were chased out of Ghana three years ago. Future research should look to examine who these people are, how they went to Ghana in the first place, how the spoils of this gold rush have been distributed amongst the Chinese participants in this story, and what the remittances meant for socioeconomic development in marginal Shanglin County and its ethnically Zhuang population. By lumping the Chinese together, ignoring the different experiences of the miners, and disregarding the fact that these Chinese are themselves a minority group in their own country, we get a distorted view of this historical episode that does not properly reflect the developmental processes and relations at play. Rather than seeing the complex webs of relationships connecting peripheral rural China with the margins of Ghana—and thus producing patterns of resource extraction, accumulation, and inequality between, within and across the people involved in both places—the Chinese as a whole are depicted as uniformly (negatively) impacting on the environment, Ghanaian politics, and the livelihoods of the poorest. In this way, the Chinese miners are ascribed with causal abilities—they are seen as the origin of the negative outcomes rather than a symptom of wider systemic issues. This shifts attention away from the labour relations and unequal power that exist within the Chinese ‘mass’, resulting in the production of winners and losers among the miners themselves. It also obscures the processes implicit within global capitalism that prompt large numbers of precarious and marginal people to move from one place to another—and sometimes back again—in search of secure livelihoods amid increasingly low returns. 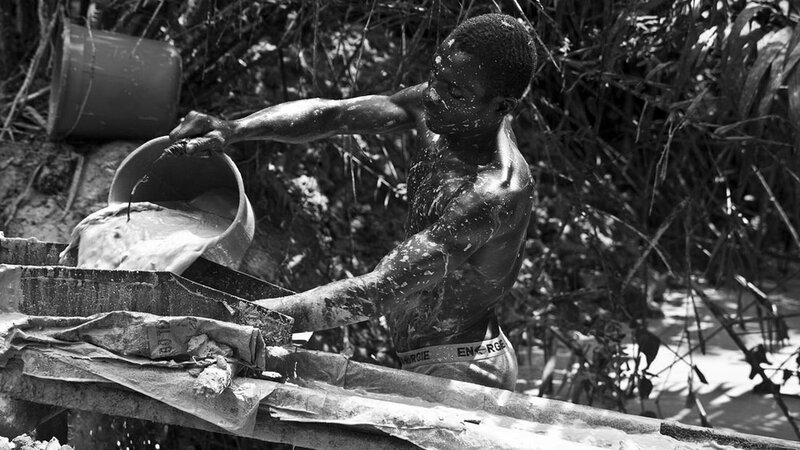 Photo Credits: Small-scale miners in Ghana, by Francis Carmine. This article was originally published on the third issue of Made in China. Nicholas Loubere is a Postdoctoral Fellow at the Australian Centre on China in the World, Australian National University. Gordon Crawford is Researcher Professor of Global Development in the Centre for Trust, Peace and Social Relations, Coventry University.